A Perseid meteor streaks over Mount Laguna, California in this stunning photo captured by skywatcher Jason Miller in the wee hours of Aug. 12, 2016 during the peak of the 2016 Perseid meteor shower. The Perseid meteor shower peaked last night (Aug. 11-12), dazzling the Northern Hemisphere with shooting stars across the sky — and Space.com readers caught some amazing photos of the spectacle. A bright moon made this year's Perseids more challenging to capture, but once the moon set late-night stargazers took full advantage of the peak — like Jason Miller, who caught the above photo of a Perseid meteor streaking over Mount Laguna, California in the wee hours of the morning. You can see more awesome photos of the 2016 Perseids here, which were sent in by Space.com readers. The Perseids come around every year when Earth passes through the streams of dust and debris left behind by Comet Swift-Tuttle, which whips past Earth in its orbit around the sun every 133 years. This year, the peak was forecast to be particularly spectacular — the Perseids were in a rare outburst, according to NASA scientists. Skywatcher Alex Paul created this long-exposure view of the 2016 Perseid meteor shower from northern Indiana while observing the shower's peak on Aug. 11-12, 2016. Alex Paul took this vivid image of the Perseid meteor shower just after midnight this morning in northern Indiana. NASA calls the Perseids the "fireball champion" meteor shower because it tends to have bright meteors that can be seen even in less than favorable conditions. A bright Perseid meteor flashes in a night sky tinged with smoke from nearby forest fires in this view by photographer Barbara Matthews captured from Nevada County, California during the peak of the 2016 Perseid meteor shower on Aug. 11-12. "A bright flash of a meteor as the light of the moon began to dim," Barbara Matthews told Space.com in an email along with her photo, above. "Taken in Nevada County, California, the normally clear dark skies tinged with smoke from ongoing forest fires in the state." Meteor showers last a long time, and there are spectacular views even befor the peak — and viewers have been spotting Perseids in the sky all week (as have NASA's All-Sky Fireball Network cameras for weeks, as shown in this space agency video of the celestial fireworks). Skywatcher Kenny Cagle captured this photo of two Perseid meteors from Twin Peaks Recreational Area at Lake Ouachita near Mt. Ida and Hot Springs, Arkansas on Aug. 10, 2016, just one day ahead of the Perseid meteor shower's peak. Kenny Kagle, for instance, caught this striking view Aug. 10 at Lake Ouachita, Arkansas, near Mount Ida. "Skies were clear and I was away from city lights, but I only saw about 25 meteors in the 3 hours I was out," he wrote. "I didn't even realize I caught this image until I got home." Photographer John Entwistle snapped this stunning view of a Perseid meteor over Corolla in the Outer Banks of North Carolina early on Aug. 12, 2016 during the peak of the 2016 Perseid meteor shower. John Entwistle grabbed this shot in the early morning over the beach at Corolla, Outer Banks, NC, using a 25-second-long exposure. And several other skywatchers captured amazing views of the Perseids in the days before the shower's peak. One photographer, Sergio Garcia Rill, snapped a gorgeous view of a Perseid meteor streaking over the Enchanted Rock State Park in Texas, an International Dark-Sky Association site, on Aug. 7. Astrophotographer Sergio Garcia Rill captured this stunning view of a Perseid meteor with the Milky Way from Enchanted Rock State Park in Texas (an International Dark-Sky Association site) on Aug. 7, 2016 ahead of the peak of 2016 Perseid meteor shower. Even though the peak has passed, the meteor shower continues: Rates are still high tonight, and Earth will keep passing through the streams of debris for quite some time. So if you missed last night or want to try again and catch the perfect photo, get out there! Space.com can't wait to see what you find. 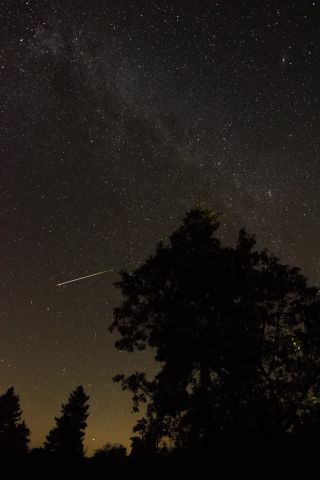 Editor's note: If you catch an awesome photo of the Perseid meteor shower that you'd like to share with Space.com and our news partners for a possible story or image gallery, please contact managing editor Tariq Malik at spacephotos@space.com.